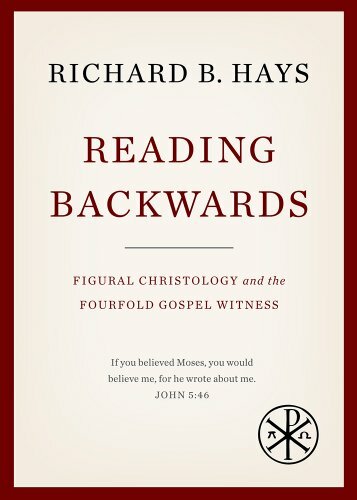 In the afore-mentioned Reading Backwards, Richard Hays considers a passage (the parable of the wicked tenants) in which the OT shapes the text powerfully in allusive and indirect ways which require a thoughtful approach. He compares the story as contained in Mark 12:1-12 with the version in the extra-canonical 2nd-century Gospel of Thomas 65-66. In the comparison below (taken directly from Reading Backwards, p.10, the bolded bits are where the NT text points back to its context in the OT. Then he began to speak to them in parables. "A man planted a vineyard, put a fence around it, dug a pit for the wine press, and built a watchtower [Isa 5:2]; then he leased it to tenants and went to another country. When the season came, he sent a slave to the tenants to collect from them his share of the produce of the vineyard. But they seized him, and beat him, and sent him away empty-handed. And again he sent another slave to them; this one they beat over the head and insulted. Then he sent another, and that one they killed. He had still one another, a beloved son [Gen 22:2; Ps 2:7; Isa 42:1]. Finally he sent him to them, saying, "They will respect my son." But those tenants said to one another, "This is the heir; come, let us kill him [Gen 37:20], and the inheritance will be ours". So they seized him, killed him, and threw him out of the vineyard. What then will the owner of the vineyard do? He will come and destroy the tenants and give the vineyard to others. Have you not read this scripture: "The stone that the builders rejected has become the cornerstone; this was the Lord's doing, and it is amazing in our eyes? [Ps 118:22-23]"
A good man had a vineyard. He gave it to tenants that they might cultivate it and he might receive its fruit from them. He sent his servant so that the tenants might give him the fruit of the vineyard. They seized the servant and beat him; a little more and they would have killed him. The servant came and told it to his master. His master said, Perhaps he did not know them. He sent another servant; the tenants beat him as well. Then the owner sent his son. He said, Perhaps they will respect my son. Since those tenants knew that he was the heir of the vineyard, they seized him and killed him. Jesus said: Show me the stone which the builders rejected. It is the cornerstone. Some NT scholars have speculated that Thomas' expurgated version of the parable is more historically authentic than the canonical versions (i.e., closer to the teaching of the historical Jesus) because it is less allegorical. In fact, however, the chief effect of Thomas' exclusions is to extract the parable from its Jewish historical setting, distancing it from the cultural and religious context in which Jesus lived and taught. He goes on to explain beautifully how the Jewish context (that Jesus constantly evokes in the telling) deepens and intensifies the effect of Jesus' story. The Gospel of Thomas... offers a colorless, enigmatic version of the parable that distances it from the story of Israel and leaves it open to be read however the reader may choose; in the case of Thomas, the parable is co-opted into a gnostic message of detachment from an evil world. Thus, Thomas' editorial de-Judaizing of the parable illustrates the loss of meaning - or, better, distortion of meaning - that occurs when the Gospel traditions are artificially removed from the canonical matrix of Israel's story. Thomas' stripped-down text is almost certainly historically secondary. But it made me wonder: why did Thomas (using Thomas as shorthand for whoever put the text called the Gospel of Thomas together) redact the account from Mark? Why did he strip the account of its Jewish context? He was simplifying the text for his non-Jewish audience. Perhaps he thought it was too complex, and pulled the story out of its context to make it simpler for his hearers to understand. If so, he did profound damage to the story - distorting it to the point of eviscerating it. He had a different agenda - to present "a gnostic message of detachment from an evil world" - and stripped the text down to suit. If so, he understood very well how the Jewish context attached the message deeply into this life, this world, these people... and therefore de-situated it. He was using the text against itself with sophistication. Perhaps he didn't get the value of these echoes of the OT. Perhaps he thought they were unnecessary flourishes which distracted from the actual point of the parable. If so, he was quite an unskilled reader, and it makes me wonder how such an unskilled reading survived the centuries. He wanted a Jesus who was not Jewish. Perhaps he was a Gentile who disliked Judaism and Jews, and felt the Jewish context was an unfortunate encumbrance to be removed. Many more possibilities, of course, only constrained by creativity and context. There's a fifth narrative that might fit, a variation on the fourth. It's certainly more speculative, but I think it reflects well the realities of the human condition . I wonder if this kind of redaction is primarily an emotionally driven act: powerful emotional forces driving the complex intellectual act of sanitizing the text. the anger that tears the photo in two down the middle after you break up. the pain that spends entire days removing every trace of your former friend from your Facebook history. the hurt that retells the entire history of your marriage after the divorce is done. the shame that drives your entire academic career into deconstructing the faith of your youth. I wonder if Thomas was a Jewish follower of Jesus, who felt rejected by his own Jewish community, and worked out the pain of his rejection by removing every trace of his former community from the narrative of the one he had chosen to follow. Perhaps he saw Mark's Jesus as too Jewish, too much identified with the community that had rejected him, discarded him, persecuted him. Hurt is a powerful force. We are all intensely emotional creatures at our core, and no matter how we cover up our emotional responses with reason and logic and facts and data, we're still working out our feelings.